Elisa Wallace, whos2018 America’s Most Wanted Thoroughbred contest, accepting their $10,000 prize check. Photo by Anne Litz. 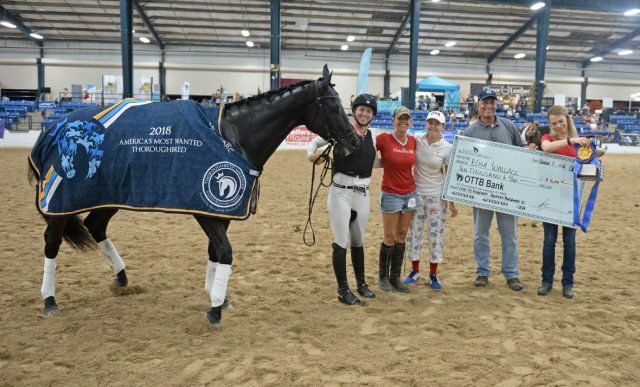 The Retired Racehorse Project announced yesterday that a total of 673 trainers have been accepted for the 2019 Thoroughbred Makeover and Symposium, presented by Thoroughbred Charities of America. Becoming an increasingly-popular event for off-track Thoroughbred lovers and often a gateway goal for first-time OTTB owners, the Makeover will take place Oct. 2-5, 2019 at the Kentucky Horse Park in Lexington, Kentucky. The 2019 trainers come from 44 states and four Canadian provinces, representing professionals, amateurs, juniors and a new team entry format. For initial application, trainers selected a primary discipline in which they had the most experience, though they’re not locked into entering this discipline for October. Eventing and show hunter are the most popular disciplines heading into the 2019 training period; a total of ten disciplines are represented at the Makeover including barrel racing, competitive trail, dressage, eventing, freestyle, field hunter, polo, show hunter, show jumper, and ranch work. Trainers are competing for over $100,000 in prize money and a chance at being voted America’s Most Wanted Thoroughbred: the winners of each division are eligible for popular vote by text message from spectators watching in person and via live stream. For many trainers, however, the Makeover is less about the competition and more about the experience of taking a Thoroughbred from track to second career successfully. Numerous big names will be participating in this year’s Makeover: 2018 eventing champion Elisa Wallace, world champion colt starter Dan James of Double Dan Horsemanship, world champion barrel racer Fallon Taylor and two-time Breeders’ Cup-winning jockey Rosie Napravnik (now an eventer). Other event riders accepted as trainers include Ellen Doughty-Hume, Dorothy Crowell, Hillary Irwin, Kendal Lehari, Natalie Neneman and Cathy Wieschhoff. Click here to view the full list of accepted trainers. The entire Makeover rulebook underwent some changes for 2019, with an increased emphasis on equine welfare: all horses competing in the Makeover must be microchipped, and microchips will be scanned at a new vetting-in upon trainers’ arrival at the Horse Park in October. New scoring, including overall “impression scores,” keep the Makeover’s emphasis as a training competition rather than an end-goal horse show. Trainers don’t need to have selected their Makeover horses yet; in fact, some may not acquire their horses yet for several months. Others are well on their way in training already. Trainers will take to social media to share their progress; check out the #TBMakeover hashtag to follow along. We’re also planning to line up some bloggers across all three Nation Media sites, so keep an eye out for those as well. Nation Media was well-represented at the 2018 Makeover, with Eventing Nation’s Kate Samuels placing fifth in eventing and sixth in show jumping with Turkomani; Horse Nation’s Kristen Kovatch Bentley placing seventh in ranch work and participating in the freestyle with Jobber Bill; and Jumper Nation’s Meagan DeLisle participating in field hunter and competitive trail with Flashback Justice.